Please click the stock number on the left for more detailed information and larger pictures. Please note: the illustrations make the medals appear to be roughly the same size, so special attention should be paid to the diameter mentioned (in millimetres) in the description. Egypt/ Great Britain, Mehemet Ali Pasha, The Overland Route to India preserved 1840, bronze medal struck 1842, by A J Stothard, 58mm. Very rare. 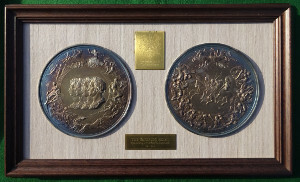 Manchester, Exhibition of Art Treasures 1857, bronze medal by Pinches, 42mm, in case of issue. Very rare and previously unrecorded. Theatre, Sir Augustus Harris, actor and London theatre owner, bronze laudatory medal 1891, by E Lanteri, 49mm. Very rare. George VI, Coronation 1937, bronze medal by H B Sale, 50mm, in original case of issue. Rare.